Four Big Questions: #3 What practices or tools can assist in my growth? While I grew up on a farm, my husband grew up around construction and carpentry, as his dad was a builder. 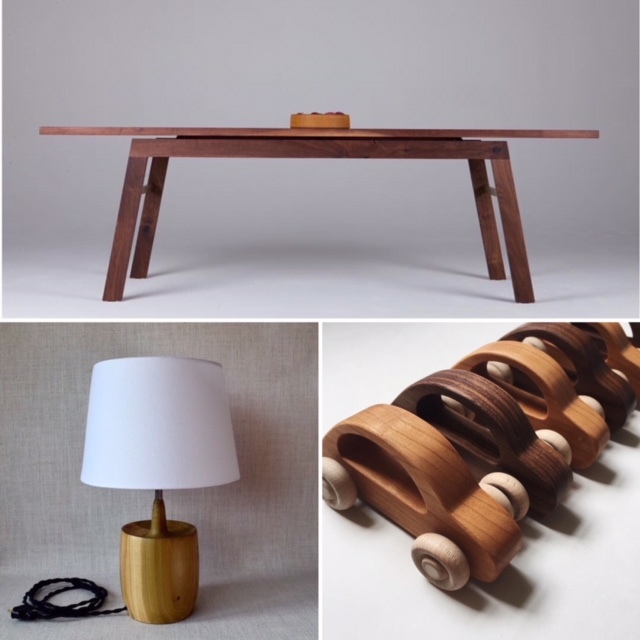 Three out of our four grown children have picked up the woodwork side of the family and each has their own local business ranging from children's toys to wooden bowls and lamps to furniture. They all have hand and power tools specific to their creations. While one uses a saw for cutting small intricate curves to make children's toys, another uses a power machine to plane large slabs of reclaimed lumber to create a dining table. Still another uses a lathe to create a round lamp or a bowl. The tool matters to the desired outcome. Just as there are specific tools necessary to create a bowl, a table, or a toy, there are practices and tools available to participate with the Spirit’s work in our lives. The answer to the first Big Question to Experiencing Wholeness - where is God leading me to change - should be the determining factor in choosing what tool or practice makes sense. What is the desired outcome? What’s in your toolbox that can assist you? Everyone’s toolbox has the Bible and prayer available for any situation you find yourself in. They are the essentials. God’s Word’s has authority to convict, equip, and empower towards wholeness. Prayer is the heart connecting with God, whether seeking guidance, rejoicing in gratitude, making an appeal, expressing grief, celebrating in joy, calling for protection, giving thanks, or seeking forgiveness. The Word and prayer are two powerful tools, both offensive in warding off the enemy's tactics. What other tools have you used on your journey of growing in faith and wholeness? If a certain practice or tool is not producing wholeness and Christlikeness, then consider setting it aside and ask God to highlight a different tool that will assist you in participating with His transforming work in your life. Tools are only tools. They have no value in and of themselves. Their value is in what they produce. Tools assist us on the journey, but it's only God who transforms us into beautiful creations. Listening to the Spirit's voice, surrounding ourselves with community, and utilizing the tools available to grow are all important towards wholeness, but there's one more question that fleshes all this out. Next week we'll take a look at the fourth Big Question to Experiencing Wholeness. Transformation is not only for our sake, but for the sake of others. Four Big Questions: #2 Who can join or help me in growing spiritually? Last weekend I went back home to Pennsylvania where I grew up and lived until I went off to college. My whole family still lives there. I'm the only one who ever left county, state, and country. I had the privilege to share at what was my home church during my teen years, and I was reminded once again how significant community is to our wholeness. Ono United Methodist, was, and still is, a thriving, community-centered church, surrounded by rural Pennsylvania farmlands; the village of Ono consisting of about 30 houses situated along old route 22. Just a couple miles up the road from the farm I grew up on, even now, many who attend are those with whom I went to elementary and high school. Now their kids and their grandkids go to Ono UM. The year I graduated from high school was the same year the church started the IF group. IF stood for Intermediate Fellowship. There were a number of young people who no longer fit the youth group age. Many of us were in-between high school and college, others were home from college, and still others had graduated from college. Some didn't have plans to go to college, choosing a farming or vocational career instead. It was a timely beginning for me, and I've not experienced anything like it since. I'm taking the picture. :) This is some of our group. Two from this picture have passed on when life was yet young. At the same time one of my classmates had a sister returning home following college graduation. Even though there was four years difference in age, Karen and I quickly became best of friends, and were an integral part of the IF group. I think we were able to offer each other something we both needed at the time. I needed to be stretched and challenged. She needed spiritual grounding. I needed her encouragement and high belief. She needed a place to belong, a safe place to grow in her walk with Christ. Within a mile of the church was a wooded area we called the “church grove.” Sunday School picnics were held at the grove each summer, among other activities. The IF gang camped out at the church grove just about every weekend and almost every month of the year. Sleeping around a campfire in our sleeping bags in the dead of winter. Someone would bring a guitar, we’d sing, we’d share, we’d laugh, we’d pray. It wasn't unusual for all of us to walk into church on Sunday morning smelling like campfire smoke, still in our camp clothes. Every Thursday night we’d meet up at someone’s home for Bible study. We’d serve together; raking fall leaves for the elderly, serving hot coffee to truckers at a roadside rest stop on Interstate 81, and leading worship for Wednesday night prayer meetings. In the summer, on Sunday afternoons, you could find us meeting at Jennie Wentling’s house (grandma to some of the IF'rs) to play volleyball in her big side yard. We truly did LIFE TOGETHER. I’m not sure that I can fully comprehend what those IF years did to shape my life. I'm pretty sure I would have never had the courage and belief that I could make it in college without the support and encouragement of Karen and the IF group. Though there were defeats and challenges in those years, we were there for each other, and my spiritual growth took on a fresh level of exuberance and confidence. I could write another book on just those years alone! If we think we can live this life as whole beings without relationship, we are kidding ourselves. Since those IF years, God has provided friends, mentors, spiritual directors, small groups, and counselors, who have invested in my well being, not only spiritually, but physically, emotionally and intellectually. Even now, I meet with a friend who I just happened upon at a local Starbucks. One of the baristas, neither of us knew we both lived in the Indy area. Terry? Gwen? We almost simultaneously said, What are you doing here!? Terry use to mentor my two oldest when they were a part of the youth group at our church in Michigan. Now, years later, after having both lived in numerous places, we get together weekly. We process life together (important for a seasonal person:), encouraging each other in our marriages, sharing what it is to have grown children and grandchildren, and spurring each other on in our faith. Community is an integral part to experiencing wholeness. Processing life and faith, asking the deeper questions, encouraging each other, motivating personal growth, and giving hope and affirmation. We were meant for relationship. Who has been a significant person in my life? Who can join or help me in growing spiritually? The third Big Question to Experiencing Wholeness has to do with the spiritual practices, one element to our spiritual formation. There are a variety of practices to choose from according to how you answer the first big question: Where is God leading me to change? Spiritual practices are" tools, not rules," according to Larry Osborne, author of Spirituality for the Rest of Us. Choosing the appropriate tool will enable you to participate with the Holy Spirit's work in your life. Before I go on to the second Big Question to Experiencing Wholeness, I think It's important to understand two things when it comes to listening for God's voice when we ask: Where is God leading me to change? So, this is a bit of a Part 2 when considering the first question. First, knowing the difference between conviction and condemnation is essential. The enemy likes to pull the wool over our eyes, making us think it's God that is condemning us. No, God never condemns (Romans 8:1), he only convicts, and there's a big difference between the two. Conviction is always done in love, never in judgment. Conviction comes from the Father's love, to protect, to transform, to change for the better. He doesn't overload us with a long, laundry list that overwhelms us to the point that we don't even know where to begin. He gently leads us in one or two things, and then doesn't leave us to do it on our own. He comes along side of us to accomplish his purposes in our lives. His Spirit empowers and enables us to change. Condemnation is pointing the long, bony finger of accusation and judgment, bringing shame and disgrace to the one being charged. Condemnation stems from the evil ones plans to kill, steal, and destroy. (John 10:10) The enemy's native language is lying. How many of us walk around believing lies straight from the pit of hell? (John 8:44) Deceit is the most subtle of the enemy's tactics. You're not good enough. You're not adequate. You're stupid. These were lies I believed for years. Recognizing his lies is the first step towards freedom. Once I acknowledged the lies as lies, I could begin to renew my mind with God's truth. He sees me as his beloved child, competent and worthy. He is proud of me and chose me to make a difference in the world where I live, work, and play. Understanding the distinction between these two words will equip you to walk in the freedom and love of God's grace. Back in the day when my kids were just beginning to seriously date, I read a book, Choosing God's Best. For me (since I had already chosen God's best for me:), the big takeaway from the book was Chapter Eight: Recognizing God's Voice. In this chapter, author Dr. Don Raunikar, includes a chart entitled, God's Voice, Satan's Voice. I've shared this so many times with friends, and I'll share it with you, because sometimes it's difficult to know whose voice you are following. stills you, leads you, reassures you, enlightens you, encourages you, comforts you, calms you, and convicts you. Satan's voice... rushes you, pushes you, frightens you, confuses you, discourages you, worries you, obsesses you, and condemns you. Whatever your life rhythm, you'll find the question - Where is God leading me to change? - to be pertinent to your spiritual growth. Listen for his reassuring voice of high belief, grace-filled love, and companionship. Know you are loved! Don't let condemnation pull you down. It's not from God. Run, run, run!!! Run away from the stranger's voice, the condemning spirit of the enemy. God did not mean for us to walk this life alone. Community is an important element to our spiritual formation. Next week we'll be focusing on the second of the Four Big Questions: Who can join or help me in growing spiritually? Before we begin delving into the four big questions, I think it’s a good idea to consider what I mean by the word “wholeness.” It may be a new word when we think about discipleship. What does wholeness look like? How do we experience wholeness? Wholeness comes from the word “whole.” By identifying a single unit, as in “he ate the whole thing," means the all of something. It means undamaged or unbroken, as in a broken vase is no longer whole; it is broken in several pieces. To experience wholeness is to no longer be broken. It's to be healthy and whole in every aspect of life. He gave us emotions. Though perceived through animation, the movie Inside Out characterizes the reality of our emotions. The control center of our brain transmits certain emotions as we relate in life, and to life. Joy, Fear, Anger, Disgust, and Sadness all play a part in expressing our feelings. We wouldn’t be human without them. He gave us an intellect. We have the capacity to reason, to gain knowledge and understanding through study and life experience. He gave us a physical body - both inner (what you don’t see) and outer (what you do see) that functions with such a dependency on every part in order for us to live, breath, and move. He gave us a spirit, ultimately desiring that we would connect with him - spirit to Spirit. The enemy stole the spiritual connection that Adam and Eve had with God in the Garden of Eden when sin entered into the heart of man. That decision was affected by the pull of emotions, the reason of intellect, and the motivation of physical desires. We can be like God. Why can't we eat from that tree? That fruit sure does look good! Did God really say... They chose sin over connection with God. That choice impacted all mankind thereafter. It is only through Jesus that we can become spiritually alive, connecting with the One who created us and desires us whole. It's a life-time journey, but one that God empowers and enables so that we might be more like him. Wholeness in Christ will impact your attitude, your behavior, your thoughts, your relationships, your desires, and your heart. 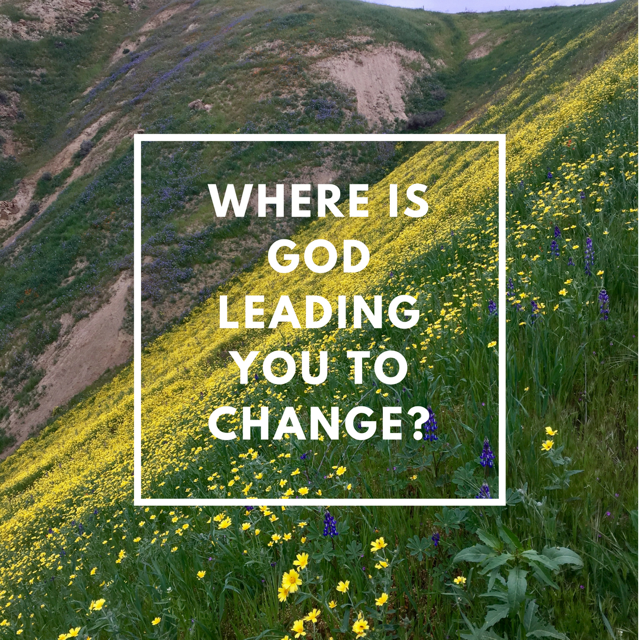 My next blog post will focus on the first Big Question: Where is God leading me to change?